Perhaps yesterday’s close up stumped some of you – it certainly looks more like a clock spring than a conventional flower. 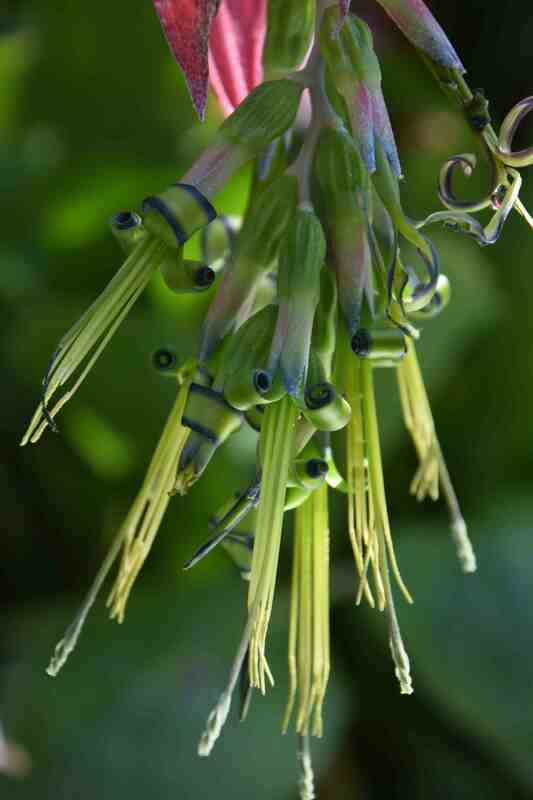 But it was the ‘three-on-three’ flower of a bromeliad, with three sepals, in this case with blue tips, and three longer petals, green, edged with blue and curling tightly. Bromeliads are best known by the pink-bracted houeplant – Aechmea fasciata and Ananas comosus, the pineapple, but I have known and grown bromeliads of some sort most of my gardening career, and this has mostly meant billbergias. Billbergia (named for the Swedish botanist Gustaf Billberg) is a large genus with mostly epiphytic (perched on branches or rocks rather than growing in the soil) plants from Mexico, Central and South America and the West Indies. Like most bromeliads the leaves form ‘vases’ that collect water but the most commonly cultivated billbergias have rather narrow leaves and form wide clumps so the vases are less obvious than in some others. 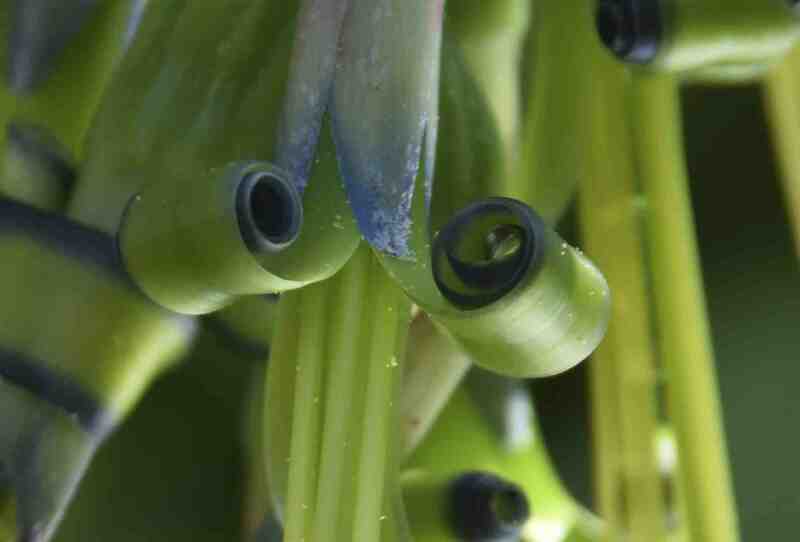 Like others though, the flower stem is produced from the centre of the vase and once it has been produced, the rosette dies. 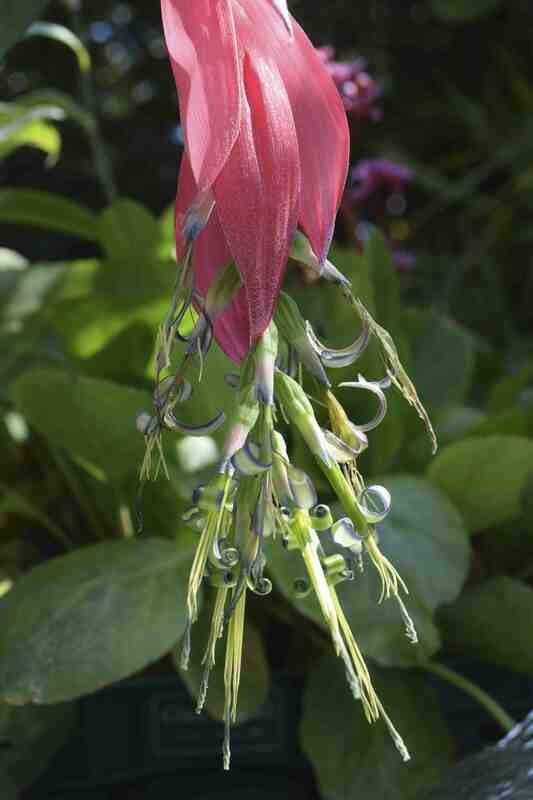 But sideshoots are produced from the stem at the base so the plant itself does not usually die, though some genera are monocarpic – just not bilbergias. So this one is B. x windii, a hybrid of the very common B. nutans (sometimes called Queen’s tears) and B. decora, raised in Belgium and introduced in 1882. In most bromeliads the flowers are either small or very short lived while the bracts do most of the job of attracting pollinators and they are showy for many weeks or months while the small flowers come and go. This is one of the reasons bromeliads are (or should be) popular house plants. But in billbergias the flowers are larger and showier than usual, but they do not last very long and nor do the bracts which, though very bright when wrapped around the developing buds and when they expand as the flowers open, quickly fade and wither as soon as the flowers shrivel. It is all a bit fleeting for a bromeliad! But no less spectacular for all that and some, including B. x windii, are among the easiest of any plants to grow, as a houseplant in the UK and Ireland or even outside in shade where you can keep it just about free from frost. I have tried both B. x windii and B. nutans outside from time to time and they usually survive for a few years but are not happy – I will keep trying and I am sure that in a moist, shaded spot with a run or mild winters they would thrive. I like to push the boundaries but I don’t like torturing plants and seeing them suffer! 7/10 – a bit slow to grow and likely to be left in the downstairs loo! I have had a very neglected one in an unheated greenhouse for years. They are indestructible.